Samsung takes on Spotify and iTunes with Music Hub | What Hi-Fi? 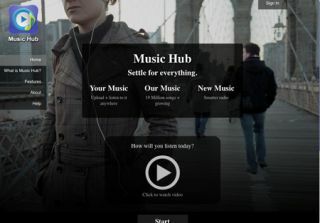 More details have emerged of Samsung's Music Hub streaming service, being launched on the new Galaxy S III smartphone. Following on from its purchase of US cloud music and movies provider mSpot earlier this month, Samsung has confirmed that it plans to take on the likes of Spotify, Last.fm and iTunes with Music Hub. There will be two options: a free Music Hub service, or a Premium one which costs £9.99 a month (exactly the same as Spotify Premium). Music Hub Premium (€/£9.99 per month): For a monthly subscription, users can upload and access their entire music collection anywhere, listen to millions of tracks with unlimited streaming of the Music Hub catalogue, and discover new songs with radio stations based on favourite artists. Music Hub will initially be available on the Galaxy S III, before being rolled out to other Samsung devices including Smart TVs, PCs and Macs. The service will be powered by mSpot and 7digital, and will offer cloud storage with a 'scan and match' service like iTunes Match, with 100GB of storage for all unmatched songs. There'll also be a streaming radio service, allowing you to create personal 'stations' based on songs and artists you like, plus a personal recommendation engine like Apple's Genius. With a catalogue of 19 million songs available for both download and streaming, provided by 7digital, Samsung is clearly taking its challenge to Apple and others seriously. It may even release a version for other mobile operating systems. And iTunes users can even upload songs to Music Hub and then stream to their Samsung phone. However, you may have to wait a bit longer before being able to trial Music Hub. The launch of the Samsung Galaxy S III smartphone, due to go on sale in Europe today, has been delayed due to massive demand.